Do the Jews of Today Know the Kenites Intermixed with Them? Do you know of any documentation, from Jewish sources, that the Kenites (i.e., descendants of Cain) mixed with God’s people Israel? In other words, have any of today’s religious Jews ever admitted that the Kenites had intermixed with them? Yes, there is at least some documentation from Jewish sources. I’ll tell you about two more or less modern-day examples in which Jewish religious leaders admitted to being descendants of Cain, one that I cannot personally document, and one that I can. In other words, the Jewish religious leaders confronting Christ may well have been children of Abraham through intermixing with the children of Israel. But by their wicked works it was obvious that they took after their father, Cain, the first murderer, and not after Abraham who deeply loved God and His long-promised Savior. In other words, they replied that they weren’t born of the fornication that took place in the Garden of Eden between Satan and Eve, which resulted in the birth of Cain (I John 3:12). Joh 8:46 Which of you convinceth [i.e, convicts] me of sin? And if I say the truth, why do ye not believe me? In short, Christ identified these Jewish religious leaders as being of their father the devil, who had sired the first murderer, Cain. And He once again pointed out that actions speak louder than words, i.e., that although the Jewish religious leaders laid claim to a direct connection to God through Abraham, their actions proved they were not of God at all, but of their father the devil who had seduced Eve, producing the murderer, Cain, and the resulting lineage known throughout history as the Kenites. My point is this: At the time of Christ, the Jewish religious leaders vehemently denied being descendants of Cain and claimed they were not born of fornication, but instead, were direct descendants of Abraham. And Christ set them straight on the matter, telling them exactly who their father was, and letting them know that their actions and murderous intentions proved it. And this enraged them so much, they later delivered Him up to Pontius Pilate and had Him crucified for it. I remember several decades ago listening to a tape from Shepherd’s Chapel in which Pastor Arnold Murray told a brief story about having watched a television documentary in which a Rabbi was being interviewed about Jewish history and religion. Now, that was a long time ago. I was never able to find out which TV documentary Pastor Murray had been watching. And until recently I haven’t seen any similar documentation from exclusively Jewish sources admitting that the Kenites (i.e., children of Cain) had mixed with the people of Israel. Then, I found an online essay titled The Kenites of America: the Jewish Position in American Society, by Professor Daniel J. Elazar, former Professor of Political Science and Director of the Center for the Study of Federalism at Temple University. The essay was featured in Tradition: a Journal of Orthodox Jewish Thought, which is published by the Rabbinical Council of America. So it’s pretty high-brow stuff. As you’ll see below, the essay is not what you might think based on its title. And yet, reading between the lines, it certainly is what you might think. The professor does indeed admit, albeit somewhat surreptitiously, that the Kenites and God’s People Israel of the southern kingdom of Judah had intermixed with each other in Old Testament times. Basically, the professor begins his paper by stating that Jewish assimilation into American society since WWII had diluted emphasis on the traditional religious aspects of their lives. Many American Jews, the professor complained, were becoming atheistic. Others were foregoing synagogue attendance and settling into a western lifestyle, simply ignoring the religious aspects of Jewish life altogether, or only paying lip service to it. In fact, “apathetic” is how the professor characterized the reaction of post-WWII American Jews toward the religion of Judaism and its many traditions and tenets. In other words, in post-WWII America, the Jews who had come to America were beginning to lose their religious identities because of their assimilation into the American culture. The professor then briefly outlines the Old Testament story of the Kenites, claiming that the Jews of post-WWII America need to become more like the Kenites of old who lived in and around the geographical area of Judah for hundreds of years, but who kept their religious and social traditions completely intact even as the people of Israel went astray from God and chased after Baal and other idols. “When the Israelites left Egypt and resettled themselves in the Promised Land, a small tribe known as the Kenites accompanied them. We know little about the Kenites. It is believed that they were a tribe of wandering iron-smiths who joined with the Israelites, helped them in the conquest of Canaan, and then ‘settled’ in their nomadic way in the Negev where they preserved a separate identity for at least 700 years. The Israelites accepted the Kenites as partners because the Kenites accepted the essential values of Israelite civilization. They accepted the monotheism of Moses, the ethical values of the prophets, and the political concerns of the Israelites as a whole. At the same time, the Kenites felt that their way of life offered them a better way to translate those values into reality within the large context of Israelite society, and therefore, unlike other tribes who accompanied the Israelites to Canaan, refused to assimilate among their hosts but held fast to their own way of life. And, indeed, it appears that they were substantially correct in their evaluation. When the Israelites succumbed to idol worship, the Kenites seem to have remained steadfast in their belief in the Lord. In other words, Professor Elazar writes in his journal paper that the Kenites held tightly on to their social and religious traditions, even while living among the Israelites who were operating in full-blown apostasy from God’s Word. Jer 35:2 Go unto the house of the Rechabites, and speak unto them, and bring them into the house of the LORD, into one of the chambers, and give them wine to drink. Jer 35:5 And I set before the sons of the house of the Rechabites pots full of wine, and cups, and I said unto them, Drink ye wine. Keep in mind that God is telling Jeremiah to do all of this. At God’s behest, Jeremiah has brought the leaders of the main tribal branch of the Kenites — the Rechabites — right into the house of the Lord. And now he’s offering them wine to drink, which of course, would later become symbolic of Christ’s shed blood. The Rechabite branch of the Kenites studiously obeyed the religious traditions of their forefathers, refusing to deviate from them, even when they were invited right into the temple of God and asked to do otherwise. Of course, you know symbolically this means they’d later reject the shed blood of Jesus Christ, as well, which is represented by the holy communion wine. In other words, their religious traditions were diametrically opposed to our heavenly Father’s great plan to save His children through Jesus Christ’s shed blood. But that’s not what God is looking at here. He’s looking at the strict obedience of the Rechabite Kenites to the religious and social traditions of their forefathers, in comparison to Israel’s blatant disobedience to God’s Word and their apostasy from it. Jer 35:7 Neither shall ye build house, nor sow seed, nor plant vineyard, nor have any: but all your days ye shall dwell in tents; that ye may live many days in the land where ye be strangers. You see, part of God’s curse on Cain after he murdered his brother Abel in Genesis chapter 4 was that Cain and his descendants would not be able to grow crops to any significant degree, and that throughout much of history they’d be wanderers/vagabonds, living in tents. In other words, they’d be largely a nomadic tribe. So the Rechabite Kenites that Jeremiah brought into the temple were not agriculturalists like the people of Israel, because God’s curse on Cain would not permit it. Crops wouldn’t grow for them, and still won’t to this day. They need other people, of other races, to do their farming for them. And instead of dwelling in permanent structures, the Rechabite Kenites of old instead dwelt in tents they could uproot at any time and move on, like fugitives and vagabonds. In other words, because of the curse of God on their father Cain, they were nomadic wanderers, which is why you find them scattered throughout every country of the world today. Jer 35:10 But we have dwelt in tents, and have obeyed, and done according to all that Jonadab our father commanded us. Believe it or not, this strict obedience to the traditions of their forefathers actually impressed God, because His own people Israel and Judah were completely disobedient to Him and His Word. Jer 35:11 But it came to pass, when Nebuchadrezzar king of Babylon came up into the land, that we said, Come, and let us go to Jerusalem for fear of the army of the Chaldeans, and for fear of the army of the Syrians: so we dwell at Jerusalem. That’s the key: The Kenites moved into Jerusalem — the capital of the southern kingdom of Judah — and dwelt among the Judahites and Levites in the land, because it was one of the last strongholds that hadn’t been conquered by the invading armies of the Chaldeans (i.e., Babylonians) and the Syrians. God is here instructing the prophet Jeremiah to use the Rechabite Kenites as examples to the people of Israel. This is what Professor Elazar is talking about in his journal paper. God actually had Jeremiah pronounce a blessing upon the Rechabite Kenites, saying that He was so impressed with how they obey the commandments of their forefathers that He was going choose a representative from among their own kind who would, spiritually speaking, stand in covenant relationship (look up the word “stand” in your Strong’s Concordance) before Him, forever. The bottom line is that as Professor Elazar points out, the story of the Kenites living among God’s People Israel back in Old Testament times demonstrates that it is indeed possible to be a small foreign tribe living within a much larger population, and still keep ones religious and social traditions without compromise. Professor Elazar then admonishes the post-WWII Jews of America that they need to become more like the Kenites of Old Testament times. And he emphasizes that advice by titling his journal paper, The Kenites of America: the Jewish Position in American Society. Of course, that title strongly implies that Professor Elazar understood a little more than he might have let on about the Kenites and their inter-mixing with the Jews of olden times. So far, in Professor Elazar’s journal paper, the only identification between the Kenites and the Israelites is that they lived in close proximity to each other from the time of the Exodus from Egypt to the time of the Babylonian exile, maintaining distinct religious and social identities the entire time. Ultimately, it seems that the Kenites did merge with the Israelites, but only after the Babylonian exile had ended the possibility for their separate survival. In other words, he says that after the Babylonian exile the Kenites finally intermixed with the Israelites (basically, the Judahites and Levites of the southern kingdom), for the sake of survival. You see, God had promised the people of the land of Judah, through the prophet Jeremiah, that their captivity in Babylon would ultimately be to their good, and not to their harm (see Jeremiah 29:4-14). So the Kenites, being very intelligent, finally began to intermix with the remaining Israelites of the southern kingdom so they too would be protected by that promise from God while living under the thumb of the Babylonians. Furthermore, Professor Elazor points out above that not only did the Kenites “merge” with the Israelites, they also took that opportunity to begin slipping their religious traditions into the religious life of the Israelites. So there you have it: A Jewish Professor writing in a Rabbinic journal and openly admitting that the Kenites of Old Testament times did indeed “merge” with the Israelites of old, around the time of the Babylonian exile. Not only that, but he admits the Kenites of old pushed observance of their religious traditions onto the people of Israel. And later in his paper the professor even urges the post-WWII Jewish elite to do the same thing in largely Christian America. Of course, the Jewish (i.e., Kenite) religious traditions Professor Elazar urges his fellow Jews to maintain and spread among American Christians are the very same rigid religious traditions Jesus would berate the Jewish religious leaders for teaching His People Israel. And why did Christ berate the Jewish religious leaders for their traditions? Because those traditions pushed aside God’s Word and essentially neutralized it. In other words, the Kenite religious traditions, once instilled into Jewish religious practice through the Kenite influence, became substitutes for God’s Word among God’s People Israel, just as religious tradition of any kind eventually becomes a substitute for God’s Word. “Full well ye reject the commandment of God, that ye may keep your own tradition…Making the word of God of none effect through your tradition, which ye have delivered: and many such like things do ye.” (Mark 7:9-13). Christ’s teachings — which were straight from the Old Testament Word of God — did not align with the religious traditions of the Jewish religious leaders, who were in reality offspring of Cain, the first murderer. By Christ’s time, the Kenites had long since taken over the religious leadership in Israel, pretending to be Jews (Revelation 2:9 and 3:9). And over the course of centuries they had pushed God’s Word into the cracks and crevices of Israel’s religious practices, and had substituted their own religious traditions in its place. But Christ came to His own people Israel to restore the understanding of God’s Word that had been lost after the Kenites took the religious mantle in Israel. And the Kenites, in their guise as Jewish religious leaders (i.e., the scribes and Pharisees) hated Him for it. 1Jn 3:12 Not as Cain, who was of that wicked one, and slew his brother. And wherefore slew he him? Because his own works were evil, and his brother’s righteous. Most Christians don’t realize it, but the word “of” in the above verse is translated from the Greek word ek, meaning “out from the interior of.” In other words, as Dr. Bullinger points out in his Companion Bible side notes and in Appendix 104 vii, the word is “genitive of origin,” meaning it denotes the actual origin of whatever it’s referring to. In short, Cain’s actual origin was “that wicked one,” meaning the devil himself. He even recommends to the Jewish elite in post-WWII America that they need to instill Jewish religious traditions into the American Christian people, just as the Kenites had instilled their religious traditions into Israelite culture for centuries. And thus today we see the constant references to our so-called “Judeo-Christian heritage,” which is an astonishing oxymoron, for one cannot simultaneously be “Judeo” (i.e., the people who reject Christ) and “Christian” (i.e., the people who embrace Christ). As the Scripture states, “A double-minded man is unstable in all of his ways” (James 1:8). The bottom line is that yes, the Kenites of old did indeed intermix with God’s People Israel (i.e., specifically with the tribes of Judah and Levi). And at least some Jewish religious leaders down through the years have admitted it, as we’ve seen above. These are the very same scribes and Pharisees He publicly berated and referred to as “serpents” and “vipers” in Matthew 23:33, and as being the children of the devil in John 8:44. 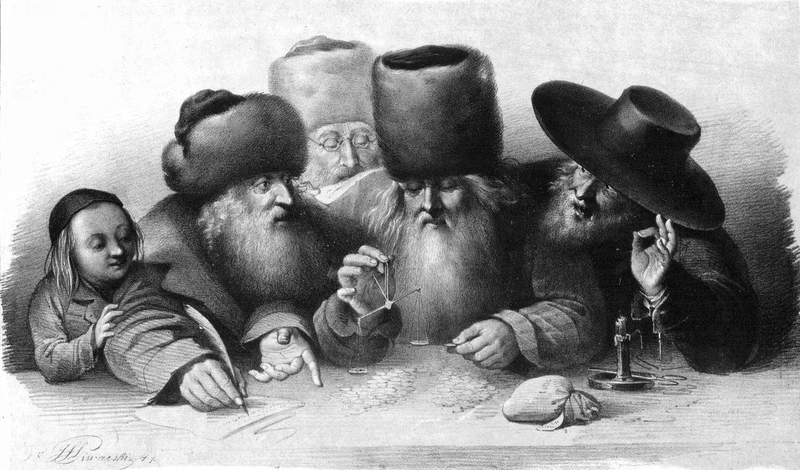 Today, the Jewish religious leaders — many of them descendants of those very same Rechabite Kenites we’ve been studying — seek to do likewise with Christians, gradually slipping their religious traditions into Christianity as a means of changing foundational Christian tenets and leading Christians astray, fixating them on religious tradition (i.e., playing church) instead of learning God’s Word and practicing it in their lives. Just as the Kenites of old gradually slipped their religious traditions into the religious life of the people of Israel, forever changing it to the point the Israelites were unable to recognize their own Messiah when He arrived (which was the whole point of doing so, of course), so Professor Elazar urges the Kenite “Jews” of America to use their religious traditions to transform Christianity as well. Such is the nature of the influence of the Kenites. They are to “drink no wine…forever” meaning they will not participate in the communion of Christ, for His shed blood is an abomination to them, though it is redemption to us. Instead, they seek to gradually slip their propensity for empty religious traditions into Christianity itself, so that it’s no longer the reality Christ instituted, but instead merely another man-made religion centered around playing church. For the sake of readers who might not be familiar with the ideas expressed above, Christ very clearly taught this concept of the intermixing of the children of the devil with the children of God in the parable of the tares of Matthew 13:24-30, and particularly in Matthew 13:36-43 where He gave His private explanation of the parable to His disciples. This is an inter-mixing of two kinds of “seed” in the same field, one seed being good and one being quite noxious. Tares are a poisonous weed. The entire wheat crop, which grew from “good seed,” had been intermixed with a seed that produced a noxious and inedible plant. In short, in His parable of the tares, Christ sets up the premise of a man who sowed good seed in his wheat field, but later was sabotaged by “an enemy” who tried to ruin his field by planting noxious weeds among the wheat. Later, the disciples of Christ would approach Him privately, asking for an explanation of the parable. They had trouble grasping what Christ was trying to say. As the old saying goes, “Inquiring minds want to know.” The disciples had not understood the parable and wanted to know the truth of it. 1.) The “field” mentioned in the parable represents the world. Yes, even today’s world. 2.) The “good seed” mentioned in the parable represents the children of the kingdom. 3.) The “tares” mentioned in the parable represent the children of the wicked one. Yes, the wicked one — the devil himself — has children. Keep in mind that what you’re reading now is not an analogy. The parable itself was an analogy. But this is Christ’s explanation of what the analogy means. It’s quite literal. If you miss that, you miss the whole point. 1.) The “enemy” who sowed the wicked children into this world was the devil. 2.) The “harvest” mentioned by Christ in the parable of the tares represents the end of the world. 3.) And the “reapers” mentioned by Christ in the parable of the tares represent the angels, who will come to this earth to do God’s bidding by getting rid of the children of the devil. For more on this topic, read the Bible study God’s Purpose, which will walk you through many other Bible passages relating to the destruction of the children of the devil which will take place after Christ’s Second Advent, at the time of the great white throne judgment of God. Christ explains that just as a farmer would gather weeds from a wheat field and burn them so they could never again pollute the field, so at His second advent the angels will gather out and burn the wicked and deceptive children of the devil who got intermixed into God’s field (i.e., the world) among God’s children (i.e., the good seed planted by Christ). Again, this takes place at the end of the Millennium teaching period, when the great white throne judgment of God in instituted, and Satan and his wicked progeny are destroyed in the lake of fire (see Revelation 20:7-15). Christ is saying the kingdom of God has to be cleansed of all of the wicked ones before we can move into the eternity. This entire flesh earth age is basically a lesson to us about that cleansing and the reason for it. The point is that just as weeds in a field will ultimately ruin a good crop unless they’re gathered and burned in the fire, so the children of the wicked one, if left among God’s children, will seek to influence them to be as wicked as they are, thus alienating them from God and His great mercy in Christ. Thus, short of repentance, the tares — the children of the wicked one — will ultimately have to be done away with in the lake of fire at the end of the Millennium teaching period. Their wickedness cannot be allowed into the eternal kingdom of God, because they would just start the process all over again there, i.e., infiltration of God’s children followed by instillation of empty religious tradition in order to negate God’s Word and alienate God’s children from Him. We are to wait, however, and allow Christ and His angels to handle that job of cleaning out the tares from His field at Christ’s Second Advent. It’s not our job to handle. It’s only our job to teach others why there’s so much evil in this world…where that evil sprouts from…and how it’s all going to end. In conclusion, the Bible teaches us that Satan has planted a wicked brood of children into this earth, among God’s own children. It also teaches us that God will ultimately do away with the wicked ones. But in the meantime, we have to be constantly on guard because of their propensity to try to intermix with us, and to negatively influence our own relationship with God by teaching us to substitute empty religious traditions for the truth of God’s Word. In other words, as Christians we are to beware of the doctrine of the Jewish religious leaders, because it, like leaven, can spread through entire congregations. And just as leaven changes the very nature of the wheat (i.e., bread) when the two are mixed together, so the doctrine of the Jewish religious leaders changes the very nature of Christianity when we allow them to be mixed together. The only way for the children of that old serpent, the devil (i.e., Rev. 12:9) to escape the damnation of hell would be to repent and accept Christ. But that’s something that’s simply not in their makeup. Nevertheless, I believe in the Millennium teaching period at least some of them will repent and embrace Christ, because God has promised to give them a representative to stand in covenant relationship before Him, forever (Jeremiah 35:19). That means at least some of the Kenites will make it into the eternity, by sincerely embracing Christ Jesus and accepting His shed blood in payment for their sins. In other words, these Jewish religious leaders Christ was talking to, who are actually the progeny of Cain, having intermixed with the Judahites and Levites of old as Professor Elazar admitted, will with great discipline continue in the murderous ways of their forefathers, going all of the way back to Cain himself. You know who killed Abel. It was Cain, the offspring of Satan (I John 3:12). Christ is telling these Kenites who masquerade as Jewish religious leaders that they’re going to pay for all of that bloodshed in the end. And of course, that will include Christ’s own blood, which they shed when they delivered Him up to Pilate to be crucified. It will all come to a head in the final generation of this flesh earth age. If you’d like to learn more about this, see the Bible study The Four Parts of God’s Plan which you can download for free, here, when you opt-in to receive future Bible studies and commentaries like this one.